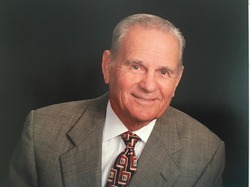 Wade Earl Turner, 83, of Waco, passed away Tuesday, March 26, 2019 surrounded by loved ones. A Celebration of his life will be 11:00 am, Friday, March 29 at First Baptist Church Woodway. A private burial will be at Oakwood Cemetery. Visitation will be 5:00 – 7:00pm, Thursday, March 28 at Grace Gardens Funeral Home. Wade was born August 6, 1935 in Brady, Texas to William and Evelyn Turner. He graduated from Brady High School in 1953. He then went on to play football and run track at San Angelo Junior College and onto Stephen F. Austin. He met the love of his life, Madonna Rives, his senior year of college. He graduated with his Masters Degree in May of 1959 and got married in Henderson, Texas on July 25, 1959, a union that lasted 59 years. Shortly after, Wade and Madonna moved to San Angelo, where he began teaching history and coaching football at San Angelo Junior College. It then turned into a four year college and Wade stayed for 13 years. In 1972, he started coaching football at Baylor University and coached the Defensive Secondary, and Running Backs. He retired in 1991 and loved his Baylor family. Wade was very active in the lives of his two girls, Kim and Allison, and his grandchildren. He loved to play golf and work in the yard. He was very involved in his Sunday School class at First Baptist Woodway. Wade’s biggest passion in life was spending time with Madonna, his soul mate. There was no Wade without his Madonna. Fairy tales happened and they lived happily ever after. Survivors include, beloved wife, Madonna; daughters, Kim Anderson, Allison Jones and husband Nathan; grandchildren, Callye Berry and husband Ben, Lindy Vick and husband Logan, Turner Anderson, and Brody Jones; great grandchildren, Reese, Crew, and Blaze. Pallbearers will be Brody Jones, Dennis Gentry, Walter Abercrombie, Jim Bryan, Jack Evans, Bill Lane, Kevin Ferrell, and Kelly Hayes. Wade Earl Turner would like to thank with overwhelming gratitude each and every person that touched his life, and his heart, in whatever way that happened to be. He would like to thank Bill Lane, his “brother”, for never letting go of his hand in life, and as he took his last breath. If you crossed his path on his beautiful journey through life, he is eternally grateful. Friends are friends forever when the Lord’s the Lord of them.